This is how we see ourselves. And even more importantly: This is how our customers perceive us. Worldwide, around 650 committed colleagues contribute their expertise to making production more economical. By designing customised machines and systems for plastic welding. By developing efficient high-precision lubrication. And, above all: Comprehensive, individual consulting accompanying all projects. In calendar week 19 you can meet us at four events. 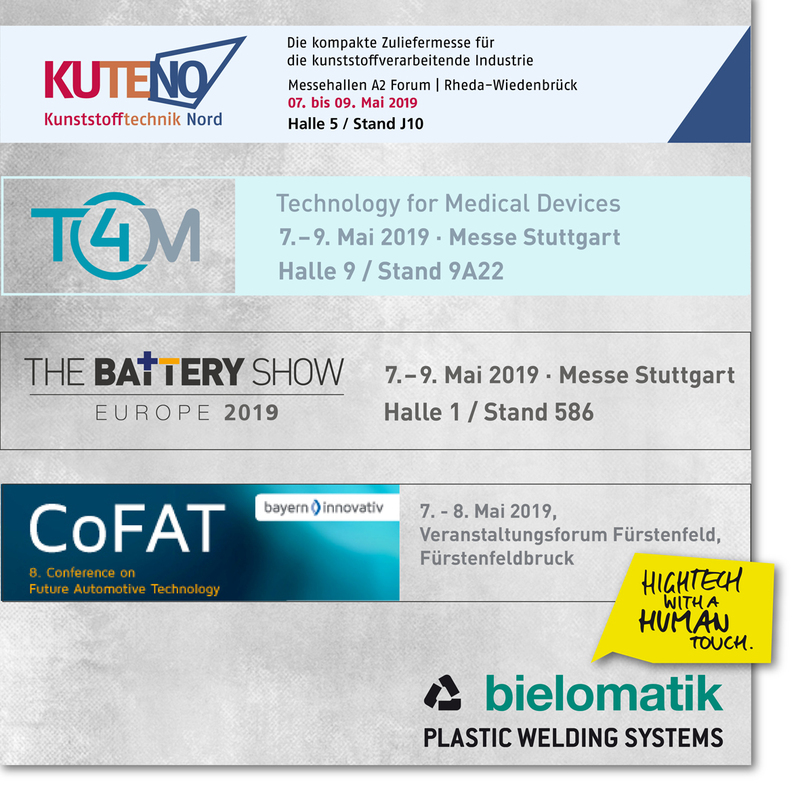 Across Germany, the bielomatik team is available to answer questions around joining of plastics, individual automation solutions as well as new technologies for almost all branches of industry. Looking forward to seeing you! Employees: New ones, good ones, please! We make high tech with a human touch. And we’re looking for people whose expertise and attitude are a good fit – with strong commitment, the willingness to tackle assignments, plus good technical know how matching his or her level of experience. Unique: High tech with a human touch! All common plastic welding technologies. Lubrication, including MQL 1-channel, as well as 2-channel systems. In addition: manual work, and a great deal of commitment. We’re the complete package – called: High tech with a human touch!